So, a few weeks ago my roommate, who also loves thinking about interesting analysis of film and culture, sat me down and made me watch this video, a youtube film by Every Frame a Painting about why Edgar Wright is really one of the only directors out there doing interesting things with comedy in filmmaking. If you haven't watched the video, I highly recommend it because it's funny and also very true, but the basic gist is this: most modern comedy relies on verbal dialogue jokes rather than actually using the medium of filmmaking for comedy. And that's true, isn't it? When we think of modern comedies, the majority of ones we can name get their humor from the jokes. It's all about those jokes, and the actual filmmaking side of things is pretty bland. We get some over the shoulder shots, some medium closeups, and the occasional two shot, and that's really it. Comedies, by and large, rely on the same basic conventions of visual storytelling they've been using for thirty years, except in the rare "artsy" comedy film, like those by Edgar Wright. 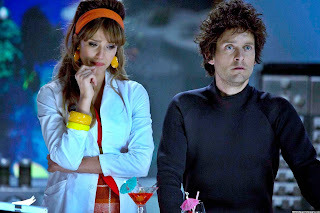 I bring this up because after I saw that video I happened to sit down with another friend and rewatch The Spoils of Babylon, a very silly spoof of seventies and eighties television miniseries. As I was watching, and laughing hysterically, I should add, I realized something very interesting. There are no jokes in The Spoils of Babylon. Not a single one. All of the humor in that movie comes from the way it is shot, edited, and acted. But the actual dialogue, while frequently funny, does not include jokes. This is big, people. This is a big deal. 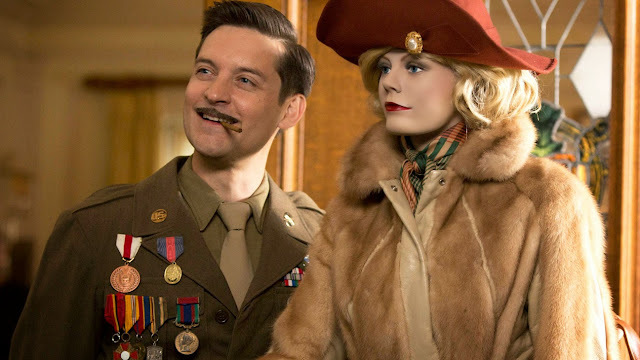 Not just because The Spoils of Babylon aptly proves that you can make a fake miniseries adaptation of a fake novel and make it so incredibly fake bad that people will pee themselves watching it, but also because it proves once and for all that comedy is not just about jokes. Charlie Chaplin didn't tell jokes, did he? No, comedy is about humor, and humor can be as inventive and infinitely defined as we want it to be. The Spoils of Babylon, for those of you who haven't had the pleasure yet, is an IFC miniseries made and produced by Will Ferrell and Adam McKay. 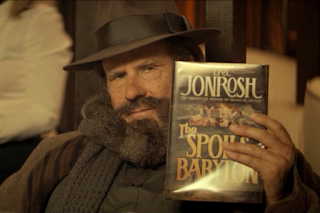 It's a fake adaptation of the nonexistent novel, The Spoils of Babylon, and comes packaged with "Director Commentary." In other words, before and after each episode we get Will Ferrell as Eric Jonrosh, the washed up pretentious author of the Spoils of Babylon book, explaining how he financed, directed, and acted in the television adaptation of his bestselling novel. The miniseries adaptation took three years to film, killed his marriage, and eventually led to his bankruptcy, which is why it is only now being shown. The six episodes make up only a small fraction of the actual material shot, Jonrosh tells us, but it's a representative portion of the show. And then we're treated to the actual story of The Spoils of Babylon, which is a parody of every self-involved, inflated, infuriating "American novel" about the twentieth century. 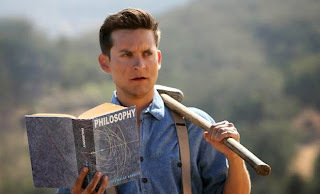 Starring Tobey Maguire and Kristen Wiig, the story is nominally about Devon Morehouse (Maguire), an orphan taken in by a strong-willed man and his daughter (Wiig), who goes on to live a legendary life while also battling his fatal attraction to his adopted sister. The story spans decades, starting into the Depression era West when the Morehouse family strikes oil, continuing through World War II and Devon's deployment overseas, and even getting into the counterculture of the sixties. It's basically a giant parody of Forrest Gump, and it's great. But, like I said above, it doesn't contain any jokes. No, the humor of the show is built into how bad it is. Or rather, how good this show is at being really terrible. Everything, from the acting to the directing to the sound editing, is contrived in such a way as to be as genuinely terrible as possible. The story of the show, then, becomes not an epic love story of a man and his adoptive sister, but rather the expression of how bad Spoils of Babylon is. So The Spoils of Babylon is a show about how The Spoils of Babylon is really terrible. That's pretty much the gist. Which, I should stress, is fantastic. It's really really funny. Everyone is clearly having an amazing time, and there's something really freeing about it all. Because none of the dialogue is actually a joke, the actors have room to be their worst selves. They're still using comedic timing, but they're using it to make everything so melodramatic you just have to laugh. For example, in the second episode Devon and Cynthia kiss at her nineteenth birthday party. It's meant to be a culmination of years of longing, but it's shot in such a way that you start laughing immediately. Everything goes into blurred fractal frames, in closeup, warmly lit, with a big band version of "You Belong With Me" playing in the background. This goes on for literal minutes. Then we're jerked out of it when Papa Morehouse finds them, calls it a sin, and freaks out. But before that can even sink in, the inexplicably placed radio turns itself on to announce Pearl Harbor. Cue Devon immediately stating his intention to sign up for the military, and then leaving the party (which is at night) to do so. The final capper on the scene is Cynthia (Wiig, doing her best) screaming "Nooooooooooooooooo!" for a solid minute, continuing even after the screen has faded to black. Do you get what I mean? The content of that scene isn't funny. It's actually really dramatic. But the way it's framed in the narrative, with the bookending devices of Eric Jonrosh reminding us of how horrible it was to film and us understanding that this is a show about filmmaking more than anything else, just keeps us marveling at how bad it is. I mean, in the second episode (I think - they've blurred together), we are introduced to Devon's English wife, the woman who nursed him back to health after the war. Devon's wife is played by a mannequin. Never explained or even acknowledged. His wife is a mannequin (voiced by Elizabeth Banks), and the scenes where she and Cynthia argue over who is a more "sensual" woman are utterly hilarious as a result. Or there's the moment in the third episode where Cynthia helps Devon get off of heroin. The camera shifts shooting style abruptly, turns to black and white, and gives us an avant-garde depiction of the process. In a later episode we get another drastic shift in filming style to give us scenes of people's faces in closeup fading in and out over each other for a solid five minutes. What makes The Spoils of Babylon genius isn't that it's bad, because bad is not inherently entertaining. Rather, it's how they use the tropes of "badness" to create something brilliant and funny. We all know that book adaptation miniseries are kind of pretentious. Let's run with that. Let's tell a story where everything is insanely pretentious. Let's tell a story with wigs and bad American accents and hilarious set dressing and editing jump cuts where there shouldn't be jump cuts. Let's tell a story that isn't actually funny, and make it funny by how we tell it. This is, to me, the essence of comedy. Have you ever seen an episode of Friends or The Big Bang Theory or another big name multi-cam sitcom with the laugh track removed? They're jarring and kind of disturbing. See, without the social cue telling us to laugh, there's often not much in those stories that is inherently funny. Without the audience laughing and telling is it's okay, Sheldon's flailing attempts to connect with people often become sad and dramatic instead of hilarious. This does the same thing, but in opposite. It shows how a story is funny because we decide it's funny. Humor is a social agreement, and there are ways to turn something not inherently hilarious into something very funny just by changing the tone. But my real point in this article is actually much simpler than all of this meta theory about humor. Basically, go watch The Spoils of Babylon. It's painfully hilarious, and you just might learn something about filmmaking in the process. Just FYI, I think instead of pasting in the link to the "Every Frame a Painting" video, you pasted the entire text of one of your previous articles. Just sayin'. Might want to fix the link. Bahahahaha! Best error. Thank you.